Elemental silicon can exist in amorphous and crystalline forms, and in between these two extremes as partially-crystallized silicon. The partially-crystallized form is often called polycrystalline silicon, or polysilicon for short. 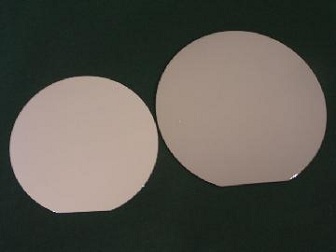 The optical constants (n and k) of amorphous and polysilicon are unique to the deposition conditions and must be measured for an accurate thickness measurement. Roughness and possible grading of the silicon film crystallinity must also be taken into account and be measured along with thickness. 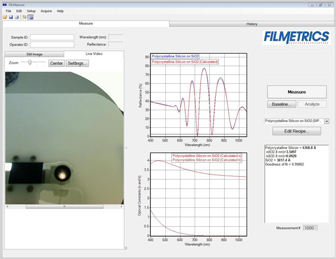 Filmetrics instruments include sophisticated measurement routines that simultaneously measure and report each of the required silicon film parameters, all with a single mouse-click. Contact our thin-film experts to discuss your amorphous polysilicon application. Polysilicon is a widely used material for silicon-based electronic devices. The efficiency of these devices depends on the optical and structural properties of the film. These properties change with the change in deposition and annealing conditions so it’s important to accurately measure these parameters. The thickness and optical properties are measured on monitor wafers which have an SiO2 interlayer to increase the optical contrast between the silicon substrate and polysilicon film. The thickness and optical properties of polysilicon films and the thickness of SiO2 interlayer can be easily measured with Filmetrics F20. The Bruggeman optical model was used to measure the optical properties of polysilicon film. Thank you for contacting us. An Application Engineer will give your enquiry immediate attention. Measure thickness, cystalinity, and n and k of all forms of amorphous and polycrystalline silicon. Filmetrics stocks instruments that measure the thousands of dielectric films used throughout industry. Filmetrics systems are used widely in the automotive industry to verify hardcoat and primer thickness. The F3-sX is used throughout the chip making industry to measure backside thinning of silicon. Proprietary analysis algorithms allow one-click measurement of TCO thickness, index, and k.
Measure thickness of angioplasty balloons, stent and implant coatings, and many others. Measure thickness, index, and k of metal films up to 50nm thick. 3-dimensional surface profile measurements to measure microfluidic channels. Use the F10-AR to measure reflectance and color, as well as AR and hardcoat layer thicknesses. 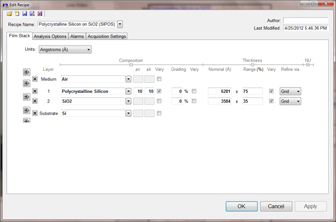 Simply set your parylene-coated sample on the stage of the F3-CS to measure its thickness! We’ve measured dozens of different resists, and can generate index files for any resist you use. Measure thickness, porosity, refractive index, and k of your porous silicon films. 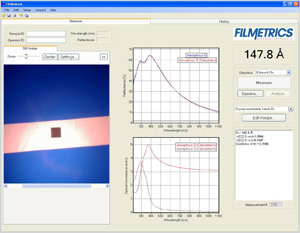 Filmetrics offers a full range of products for measuring semiconductor process films. Measure refractive index and extinction coefficient over wavelengths as wide as 190-1700nm. We offer tabletop, mapping, and production systems for measuring silicon up to 2mm thick. More than fifty Filmetrics F20s have been delivered for use in university teaching labs. 3-dimensional surface profile measurements to measure surface roughness. 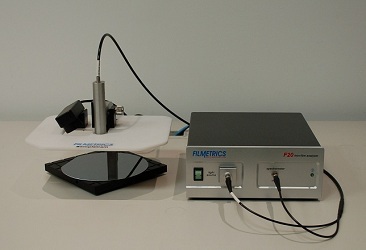 Filmetrics systems are widely used in the polymer-films community to measure thickness in-line.